Are you fed up from inviting people for your Facebook page one by one? If yes, then you've landed on the right place. This is one of the worst thing about Facebook page. 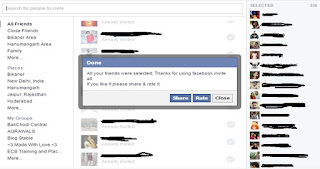 Officially Facebook has not given any option to send page like invitation in bulk. And I can bet that almost 99.99% people are tired by selecting people one by one for Facebook page like invitation. Let me show you how much complicated and time consuming this process is, say you're having 5000 friends on FB and now you've just decided to create a page. Then you started selecting your friends, wait! wait!, what I said?, are you really going to select 5000 friends? Lol! we both know that it would surely take around 1-2 hour to select all the friends. No one is going to spend this much time to get just few likes (Researches show that on inviting 5000 friends for your Facebook page, you get around 150-200 likes only). Be calm, every problem has a solution. If there's a issue then its solution is generated with a couple of days. 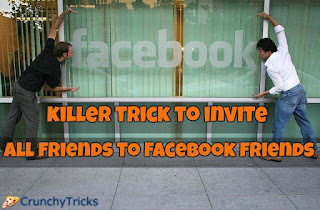 We've found some simple to use tricks which you can use to invite all your friends in just one click only. Isn't it's wonderful? Yes it is. Overall we're going to save our 1 hour. Currently we're having two ways to invite all friends on Facebook. We've mentioned both of them with complete step by step process. You don't any technical skills to use them. In short it's a single click work. You might wanna check how to share post into multiple Facebook groups in one click after reading this article. Simply click on the link and on the next page click on Install button. It'll ask you to add it in Chrome browser, allow it without thinking much. Remember you'll able to see this icon on opening your Facebook page otherwise you can't notice it. Navigate to your FB page and click on "Click here to invite your friends". Within few minutes all your friends will get selected, after that just click on invite friends. That's it. Another great, working and one click invite method. We've added one script below in order to invite all your Facebook friends. Just paste this script and let it allow to do your job. Navigate to your Facebook page and click on "Click here to invite your friends". Hit enter button and allow it to take some time. That's it, you're done. So this was all about how to invite all friends on Facebook in just one click. If you've any other working method then mention it below, we would love to share it with our friends. For any query or doubt feel free to leave a comment below in the comment section.